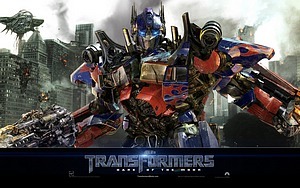 Transformers: Dark of the Moon (also known as Transformers 3) is a 2011 American science fiction-action film. It is the third film of the live-action Transformers film series, directed by Michael Bay and produced by Steven Spielberg. It is the sequel to Transformers and Transformers: Revenge of the Fallen and was released on June 29, 2011. The film is presented in regular 2D, Real D 3D and IMAX 3D, featuring Dolby Surround 7.1 sound. The film has received negative to mixed reviews from film critics, with many praising the film's visual effects and 3D action sequences, but criticizing the below average acting and script; film review aggregator Rotten Tomatoes gave Dark of the Moon a score of 36% based on 227 reviews and a rating average of 4.8/10, saying "Its special effects — and 3D shots — are undeniably impressive, but they aren't enough to fill up its indifferent script."